Unique to the Ghia limo was an internal trough/drip rail system. Front and rear door openings on the handmade roof were equipped with these concealed gutters that drained to tubes that originally dumped inside of the rocker panels. As a modification for this restoration we extended the tubes through the rocker panels to exit at the ground. Ghia only rear drip rail drain. The original drain was clear plastic hose and dumped into the rocker through a hole that had been drilled and the tube pushed into. This is no doubt part of the reason Ghias had such rusty rockers. In restoration we installed the copper tube which extends all the way through the rocker. The front trough drained down the A pillar. The stock dogleg, which helped frame the windshield (at that time, the most extreme wrap around windshield available on any car) was modified at the top to conform with the profile of the handmade windshield header molding. Also the placement of the gold crown on the dogleg was a Ghia specific item. The roof header molding is handmade and completely unique to Ghias. Here you can see the cutout applied for the front door extension. 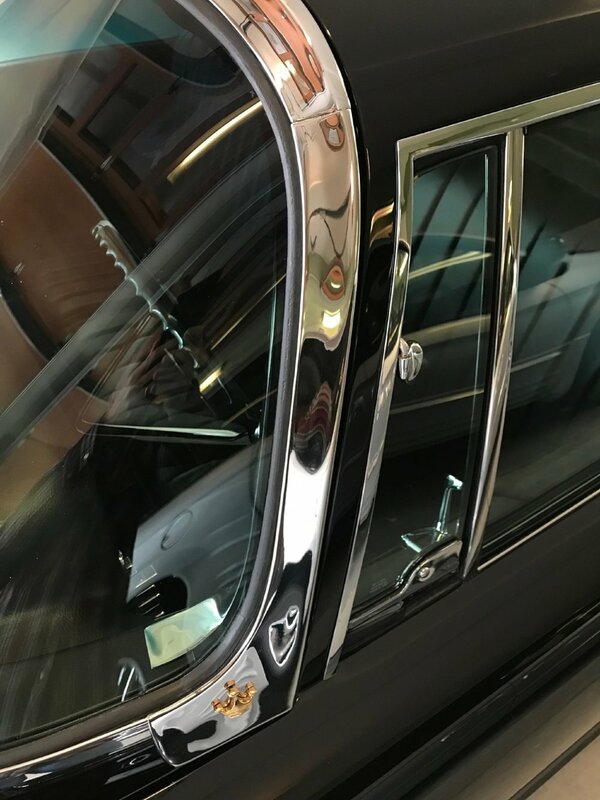 The window surround moldings are handmade of brass, individually numbered, and applied to the Ghia only roof cut-ins on the doors. The rear quarter window molding is of the same construction and also beautifully frames the Ghia only handmade quarter glass. 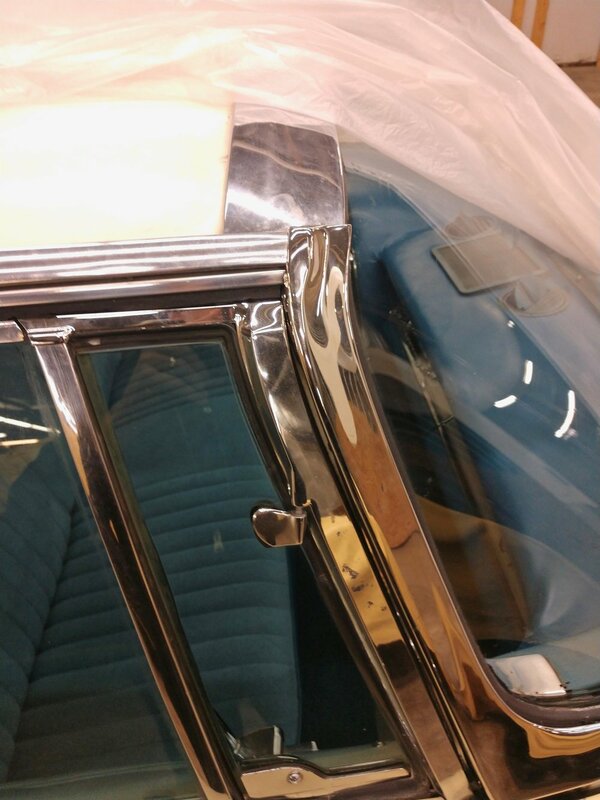 Also seen through the quarter glass is the handmade, Ghia only, interior quarter trim and limo handle. They also appear on the divider rear frame and are unique to any other hardware I can find in the ‘55 - ‘58 range, indicating they were manufactured specifically for these cars by Ghia. 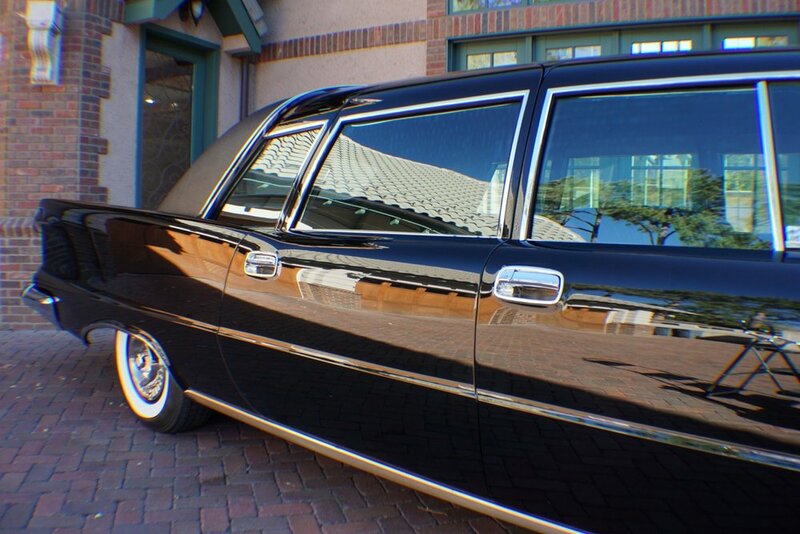 I’ve also investigated and worked on a 1958 Dual-Ghia and the hardware on the limousine does not cross over. I contracted a muscle car glass company to produce 10 sets of side glasses for the Ghias. This included from the vent windows to the Ghia only quarter windows and divider glass. It did not include the back glass. In previous articles, the glass was described as supplied by Chrysler. This is probably accurate as all the original windows were marked with the Solex brand name. Solex was Chrysler’s name for tinted glass. The tint on these Ghias was blotchy with an almost psychedelic pattern due to variations in intensity. I did not like it so I had new glass sets produced without the Solex logo. The back glass however has the Solox logo and is not blotchy. It is tempered glass. On the left is an original section of rocker panel by Ghia. 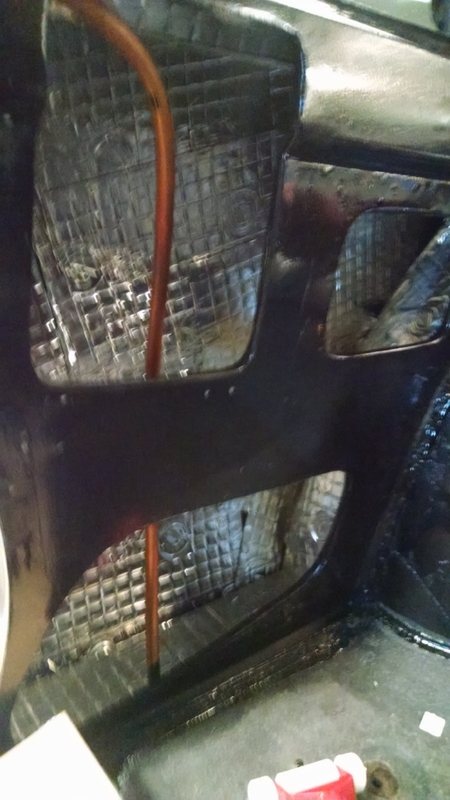 The original factory rocker section (in the non-stretched areas) was caved in with a hammer and then simply covered over with a piece of Ghia steel. On the right shows the hand made replacement pieces. A variation from Ghia original, this rocker molding is stainless steel and has a brushed appearance. The originals were awful looking as they were cast brass that was chromed and very wavy. To make matters worse, screws were driven directly through the center of the molding down the rocker. 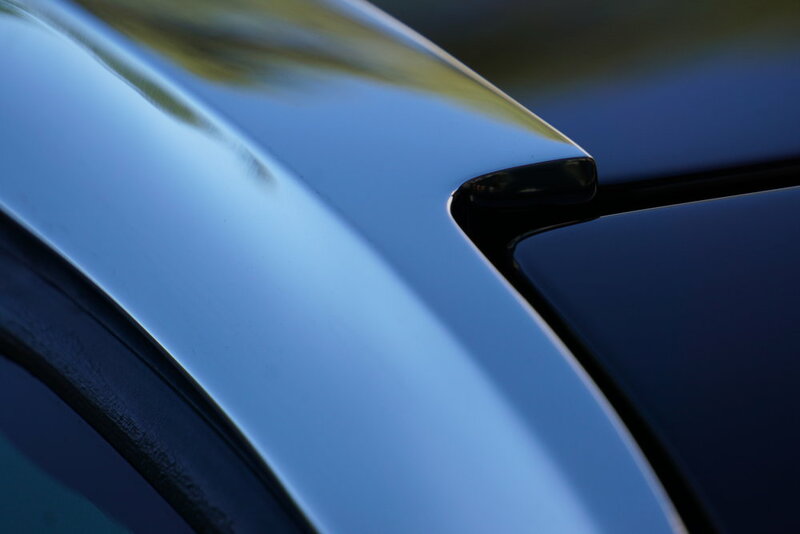 We chose the brushed finish because it’s nearly impossible to get these moldings flat enough to polish or to chrome. The quarter panels on all Imperials were two-piece constructions. This allowed the incredibly complicated stamping of the fins to be accomplished. The joining of the two panels, for productions sake, was then covered by a molding. That is why all Imperials of this vintage had side moldings. The Ghias had the molding removed (or not applied at all from the factory) and the seam was leaded, the car painted, and then a tan colored stripe was applied to the same place where the original molding ran. We have yet to stripe our car, I’m not sure I want to.